Home » Growing » Mike’s New Nursery… From The Beginning! Mike’s New Nursery… From The Beginning! This is what we started with in 2010. The insurance company gave me three weeks to fix this or tear it down. 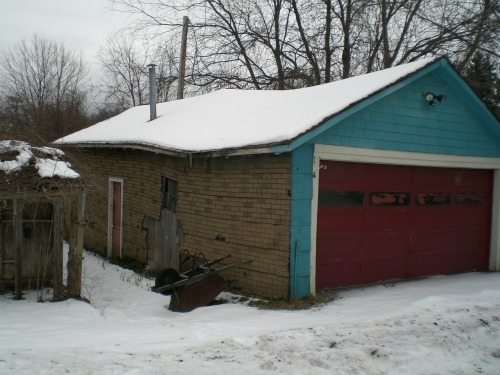 Structurally saving the building was not cost effective. 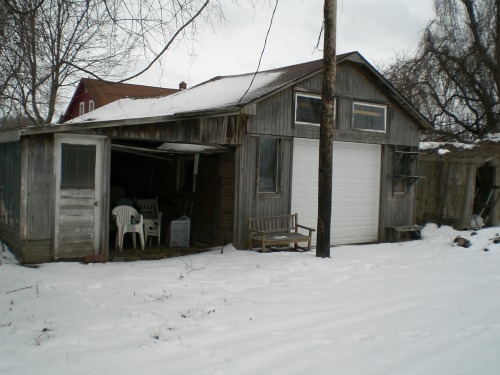 This is the back of the garage. I loved the look of these old buildings, but it would have cost more to repair them than it did to replace them. 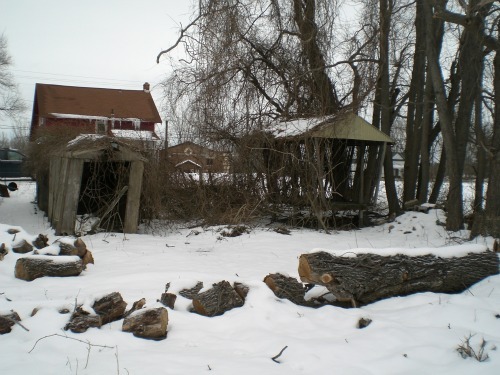 That tangled mess next to the corn crib? That’s where our propagation area is now. Spring of 2011, we had a small area cleared, but much more to go. These are the very first plants that went into the ground at Mike’s Plant Farm in 2010. We’ve come along way in a short time. This fun little video documents our progress through the spring of 2012. Original plans didn’t include two miniature donkeys, but today they are very much a part of what we do. The front container growing area is just to the right off the donkeys. This photo was pretty much taken from the same vantage point as the above photo where the ground is snow covered. The back container growing area. September 2014. This is our back container area. 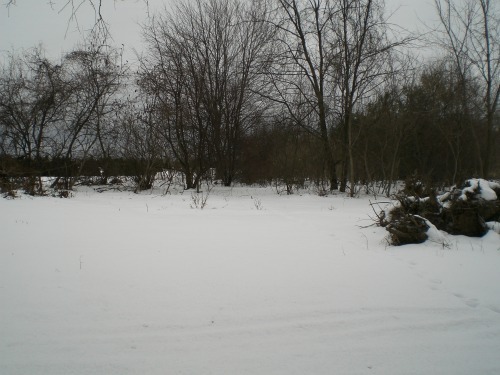 In the video this is where you saw me and Duston with the chainsaw cutting trees, digging stumps and piling up brush. This area was so thick with trees and brush you couldn’t even walk through it. September 2014. The grass area in on the left is where we park cars for our plant sales. See those two bales of peat in that area? That’s the underground bunker that you saw me opening up in the video. I use that to store bare root plants that get shipped in during winter. We call that Jimmy Hoffa’s grave. In the video this entire area was still all grown up. I actually had to clear a spot just to build that underground bunker. This is our front container growing area. September 2014. This is our front container growing area and as you can see we have some plants on tables for our fall plant sale. Up by that old ragged white dump trunk you can see the new building that replaced the ones that the insurance company despised. They really did me a favor and forced me to do what I really needed to do. The new building is great! Off to the right you can see Fergus grazing near his new, not yet completed home. In the fall of 2014 I built the donkeys a new house that is partially underground, well insulated and built into the brush pile we created when we cleared the land. Much warmer than their old digs. See that green and white plastic, carnival looking eyesore off to the left of the photo? I hated having that port-a-potty in the nursery so I told them to come and get it and I am in process of replacing it with an authentic looking outhouse. The outhouse at Mike’s Plant Farm. This is a photo of the unfinished new outhouse. As soon as it’s done you’ll be able to “Click here” to check out all of it’s really cool features. Right before our fall 2014 plant sale. Mike’s Plant Farm, Perry, Ohio June 2014. In March of 2013 we did not have a single plant in a container at Mike’s Plant Farm. We started planting everything in the ground in spring 2011 because I wasn’t sure if I wanted to grow in containers or not. But selling plants in containers at $5.97 is such a huge hit I decided to switch to containers in March of 2013. The containers have been a big hit, we sell tens of thousands of dollars worth of our small plants. We started at my standard price of $4.97 but come spring 2015 everything will be $5.97. I can offer my customers so much more by raising the price just a dollar. Three generations of McGroarty Nurseryman. Sticking cuttings with my son Duston and his three boys Aydan, Weston and Gavin. These three characters make my day! Aydan building a new plant propagation bed. Aydan is now 10 years old and wants to work in the nursery this summer (2015). By the time he’s 17 he’ll know this nursery and this business like the back of his hand. Taking a break on the tractor. Gavin, late for work as usual. This sweetheart hasn’t been to the nursery yet. She lives out of town and was just born January 8th, 2015. But I assure you, she’ll be spending some time at the nursery, with the donkeys, with Grandma and Grandpa. This is the daughter of our younger son Kevin and his wife Gracie. She’s their first! Our first granddaughter! Eileen made it to the nursery this summer and met the donkeys! So I put a bench in the donkey pen to sit on with the baby. The donkeys were only interested in trying to eat the bench! Fergus has never seen feet that small! Mike, you are an amazing guy and a gifted writer. I felt like the movie of your life, and Pam’s, unfolded before my eyes as I read. You deserve the success and happiness that you have worked so hard to achieve. You are truly inspirational. And your property looks amazing. The gorgeous grandkids are the icing on the cake. Wishing you and Pam all the best. Thank you Bonnie, I appreciate that. I am amazed how much you know, only wish I had started years ago. You help everybody and your work has paid off seeing all the replies you receive. Thank you for sharing. Thanks Emily, what amazes me is how much our members, http://backyardgrowers.com/join, learn and know in such a short amount of time. In no time they are helping other new members. Mike thanks for sharing your great story. I constantly learn from you and always get inspired. I grew up in Minnesota and moved to TN 1977. I’ve been following and joined your membership a few years back .I root Forsytha and sell. I will be expanding to more plants this year. Thanks again Mike, some day I will visit at one of your Open House events..
You’re welcome Ron and good luck with all of your growing! Wow! What a cool story. Your place looks amazing and your story is inspiring. I love the thought of a multigenerational family growing and growing things together. I just discovered your website during a search for info on Dwarf Alberta Spruce. Thanks for all the good quality and easy to digest information. I am a total newbie at growing anything. I have learned mostly through failure and am pretty proud that I grew some tomatoes this year from seeds from last year’s crop that were edible and matured before the first frost!! So, I have a long way to go. It’s awesome to have good information that is easy for a freshman gardener to understand so accessible online. Thank you for sharing. You are welcome and welcome to my world! Loved your story, Mike! Lovely grandkids! Sure looks great before the plant sale! Thanks Wesley, I appreciate that. Mike….not sure you will see this, but i was able to eradicate lots of Creepin’ Charlie last fall after the first frost but this year it has taken over large parts of my lawn. I’d like to blast it with non-selective herbicide and take my chances at renovating the lawn thi fall. What do you think? You can do that, just spray those areas with a glyphosate product and reseed, you really don’t have to do any digging, maybe scratch the surface a little. I spray patches in my lawn then reseed the next day after the spray has dried. I mark out the areas with orange paint first so I know what to spray and where to reseed. I read that creeping Charlie comes because the lawn is weak and needs fertilizer. Sounds right! Your comment. That’s pretty accurate. Good healthy lawns really have no room for invasive weeds. At least not very many of them. But like anything else, you have to keep up or they take over. Hi! I enjoy planting. I am from the West Indies. I try planting on a very small scale just for the enjoyment. I love plants. Mike you will have a wonderful grand daughter I assure you. I was born on the 4th! Thanks Andrea I appreciate that. She already is beautiful! Mike, i enjoyed all of your pictures very much! You did a lot of work. Looks great! Thanks Walt, I appreciate that. As a teenager I spent some time clearing and burning brush on the farm with just an axe, a shovel and a chainsaw. I hated it .It was never-ending. It was forced labor. Comparing your before and after pictures takes me back to that time and now I have chills thinking of the millions of hard labor hours it must have taken to clear those many acres.. And you knew what was ahead of you when you bought the property. Wow. And that doesn’t include the labor needed to grow an pot all those plants! I’ve said it before, it never felt like work, I enjoyed every minute of it. Mike, it is stunning, Awesome, It shows how much work you have put into your business. I Love it. I am new to your web site, but I have enjoyed trying to catch up. I am so proud of you for keeping America Beautiful with your knowledge and Green Thumb. Thanks Janice, I appreciate that. Hi mike I was just wondering if you could do a 2016 summer update of the nursery for your youtube fans that would be really awesome. Yes, I need to do that. We’ve added a new container area and a ton of new plants. You are inspirational. I feel like you are my new found father. I am planning to use your business model. My father passed away last month and I inherited a 30 acre farm and wasn’t sure what to use it for. I love planting and growing stuff. I enjoyed all of your videos immensely. The most important advice I can give you is this, 30 acres is wonderful, but only concentrate on 1/20th of one acre and pack it full. Then expand from there. It’s much easier to manage. My life is challenging right now and the world is a mess. Most of my inbox consists of organizations begging me for donations so they can continue to keep telling me what a mess the world is in. As an antidote I just treated myself to a leisurely cruise of Mike’s site. I have been a fan for years. I love what you do, keep it up and do look after yourself so you can keep doing it for many more years. Thanks Len, I appreciate that. Do you ever sell any Boxwood varieties at one year old off cuttings? Or do you wait until they are around 3 to sell? What do they look like on average at one year old? I hear that blight thing is pretty serious??? I’m thinking some folks in the areas hardest hit may be taking out their entire supply and may need some healthy ones shipped in. Mike i like 99.9 % of whatever you do. Please get on a regime and loose a little so you will be around for many years to come. Do a no or little carbo for six months and check the results! 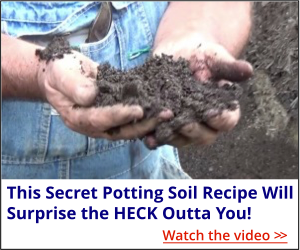 Interested in your potting soil recipe so I clicked all the buttons and gave you my email (again) but ended on a page with a very looong ad but no soil recipe. What’d I do wrong? 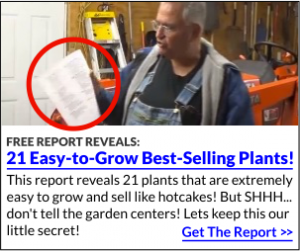 Larry, if you got to google and type potting soil ingredients plus http://freeplants.com into the search bar you’ll find my potting soil receipe. I just noticed that the site is down, probably until Monday morning when we can contact the host. i love your nursery video but will it work in Zimbabwe in Africa .I really want to try your Back Yard Nursary I am 75 years of age . If people in Zimbabwe routinely buy plants then there is no reason why you can grow and sell some plants in the area. Loved the blog and the story of how you developed your nursery. Your little donkeys are gorgeous and I see them as a bit of a crowd pleasure / catcher. Loved the little grandson running late to work! Good on you Mike. How do you protect your plants for the winter? I live in North East Missouri. I set pot in the garden for winter but a lot of work. Think the plants would freeze above ground in our sometimes zero to 10 below. I use quart to 1/2 gal pots. Mike, your grandchildren are precious! They enrich our lives like nothing else ever could. Your nursery is amazing, and I enjoy watching you live out your joy and passion of gardening. I wish I had some of your energy! Thank you for sharing! Oh, that is way too much work for me! Every once in a while I entertain the thought of moving back to the country but then I look out the window and see all those plants in their little pots that I would need to move not to mention the greenhouses! No, I think I’ll stay here in my cozy little nursery and watch the big white truck come by every week and take away my trash! I understand, but building this place has been pure enjoyment for me. Altogether a beautiful story of great success, just because your family, and pets are apart of this journey. I hope you have continual success Mike and thank you for sharing. Thanks Ann, I appreciate that. My family and I would like to visit nursery and my grandkids want very much to meet the donkeys. Can you give me the address to visit at. We are located at 4850 Northridge Road in Perry, Ohio 44081. We’ll be here all day Saturday and Sunday this weekend, Sept 18th, 19th and 20th. Cute grandkids Mike. Looks like they’re on their way to becoming nurserymen. I guess we’ll have to wait and see, it would be fun to have them around here full time. What a swell looking bunch of family members! Grandpa doesn’t look too proud or pleased. Congratulations on a fine family. I have been following you and your “free plants” for several years. I have started a few plants, but mostly for my own use. I have 5 acres — lots of room. I am trying to get a fruit field going above the chicken coop. However, I am 72 years old and don’t have the energy I used to have. I have started over a dozen Canadice grape plants and have tons of raspberries to move up there. My goal is for my grandchildren and my great grandchildren (5 of whom live with me) to enjoy fruit in season and produce from my gardens.. I loved the pictures of your nursery and your grandchildren. There is nothing better than to get up in the morning and have a little one say, “Can we go out to the garden now, grandma?” You inspire me to do as much as I can accomplish. I love seeing your emails and the pictures of your plants, donkeys, and grandchildren. Thank you Viki for your kind words and good luck with your farming! I love everything you do. You are so straight-talking and forthright that you are truly one of the few experts I totally trust and rely on. I just wished you lived in Texas. Thank you so much for all the incredibly valuable information you share. I feel privileged to be able to not only learn from you but to share what I learn from you on my Pinterest boards, one of those has been repinned 7216 times in 19 weeks! Thank you for your kind words, and I truly appreciate you sharing my stuff on Pinterest. We have a number of members in Texas who do quite well growing and selling plants. EXCELLENT Mike! We wish YOU MANY MORE Years of GOOD Health and continued SUCCESS! Just happened to come across your story through my search for answers to using Australian Pine chippings for mulch and a ground covering of an open lot with full sun in Florida. I enjoyed reading about your journey. I was born in Indiana but have lived in Florida since 1960 and I am a Florida gardener. Any suggestions regarding my search from above? I’m sure Australian pine chippings would be perfectly fine on an open lot. Eventually they will decompose into a nice layer of compost. Even in a city environment, you can do something, a little growing. Just call it a hobby, but I’m sure somebody would be interested in buying a few plants from you. Unfortunately, a hobby is all it can be in some cities. Even a small nursery is against code if you sell plants either retail or wholesale… Boo! Growing small plants can be a great hobby. As long as a person doesn’t attract retail traffic, or make their yard look like a “nursery” they probably could sell a few plants. Some cities are more tolerant than others. Jeff, not true! I am a backyard grower and live in the city. I sell retail and wholesale and according to our zoning board as long as I keep my plant sales to a few well prepared weekends I was given the ok to operate my business. As for wholesale I can sell all I wasn’t. Zoning says mailing as much as I want out of my residence is fine by them. I’m sure every town has their own laws but I’ve been in operation three years now and doing well. Looking good! I have used my Kubota to clear some land. I wish I had a backhoe. It would have been a lot easier. Thank you Donna! I appreciate that! I’m sure your plant sale went just fine. Congrats on taking action and getting it all done! Mike, Your garden looks wonderful. I have three of your roses. My favorite is “Angela Lansbury”. Not sure of the spelling. They look quite beat up now and need to be repotted. We had a bad hail storm which is really quite unusual here. My Bird of Paradise and Hydranga were shredded by the hail. I don’t know whether to leave them alone or cut them back. Thank you Jackie, I appreciate that! At last!!! I’ve needed local instruction for so many years. Thank you for posting!!! I will read all you have and I’m sure to ask your advice many times from now on. Thanks again! What the heck was that trapped door thingy in the ground? Did you know it was there? Looked a little creepy! I think the trapped door thing was where he rooted his hard wood cuttings. I live about 20 minutes out of Los Angeles and watching your video sure looks like hard work to me. What is in that square hole you propped up with sticks? Storm drain? You are doing a fantastic job with your nursery. I don’t think I have enough space to even start a small garden much less the time or the strength it takes to maintain one. Thanks for the video! Lucy, you’re asking about an underground bunker that I use to store bare root plants during the winter. It’s moist but rarely, if ever does it freeze inside. Thank you Patty, I appreciate that.